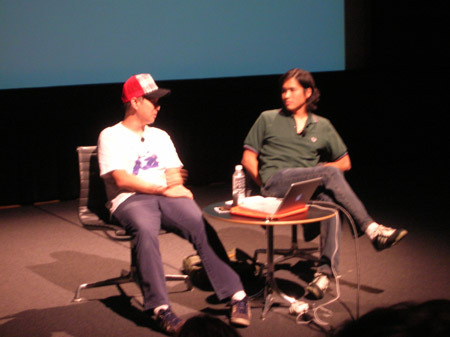 The geeks were out in full force at the 2006 Walker Student Open House for the artist talk with Giant Robot Magazine co-founders Eric Nakamura and Martin Wong. Momentarily distracted by the teens duking it out with Mortal Combat in the lobby, I rushed in to find a seat and hear about all things Asian and Asian-American pop culture. Eric and Martin are true devotees to the DIY aesthetic, and their enthusiasm was noticeably contagious in the audience, especially as they shared tales of waiting outside offices for closing time so they could sneak in to hijack copy machines, and scrounging office furniture from comics run out of business. Oh, and tofu tacos, now served at the Giant Robot restaurant. Martin swears by them. I checked in with Witt this morning to see how the after-party went. After the talk, Witt and the crew headed over to the Loring Park local watering hole, King and I Thai, for some dinner. Witt invested serious time in trying to teach Eric and Martin “Minnesota Speak” – to teach them the perfect Minnesotan ‘Oh’. It takes time and practice. Sadly, Witt reported to me, despite many efforts, Eric and Martin were unable to join the ranks as Minnesotans. But here’s the kicker – I was also at King and I Thai with a friend having a few drinks to celebrate my birthday. Giant Robot was on the restaurant side, and I was on the bar side. AND I HAD NO IDEA. Dammit. Looking back, I could have easily ditched my friend in order to hang with Giant Robot. Especially when Witt filled me in later on their midnight run to Big Brain Comics that lasted much of the night. Who needs friends anyway, right?